That is the title of one of my all-time favorite books. Written by the eminent anthropologist, Loren Eiseley, and published in 1957, it is the story of life, from its unknown origins in the dim past to its present state. Being an anthropologist, Eiseley focuses most of his attention on the evolution of Man. I first read this book almost 20 years ago, and was riveted by Eiseley’s writing. I’m not normally a science geek, although I do find it interesting. But reading “The Immense Journey” was a revelation. He was that rarity, a poet-scientist, who could explain the path of life and evolution without making it tedious and mechanical. Indeed, he mainly rejected the easy, mechanistic explanations of how Man evolved to become what he is today. Too many of today’s scientists, particularly evolutionary biologists, see everything concerning life as mechanism. Completely absent from their worldview are any purpose or meaning. Many times, the soulless prose of these scientists reflects their vision. Not so Loren Eiseley. He saw mystery not just in Man, but in all of life, and that sense of “owl-eyed wonder” (his words) illuminated his writing.
. . . but more delicate, elusive, quicker than the fins in water, is that mysterious principle known as “organization,” which leaves all other mysteries concerned with life stale and insignificant by comparison. For that without organization life does not persist is obvious. Yet this organization itself is not strictly the product of life, nor of selection. Like some dark and passing shadow within matter, it cups out the eyes’ small windows or spaces the notes of a meadow lark’s song in the interior of a mottled egg. That principle – I am beginning to suspect – was there before the living in the deeps of water.
. . . whether we speak of a God come down to earth or a man inspired toward God and betrayed upon a cross, the dream was great, and shook the world like a storm. I believe in Christ in every man who dies to contribute to a life beyond his life. I believe in Christ in all who defend the individual from the iron boot of the extending collective state . . .
Do yourself a favor. Read this book. Let me make this last point quite clear. The conduct of human life and the organization of human society depend on our answers to such questions as what happiness consists in, what our duties are, what form of government is most just, what constitutes the common good of society, what freedom men should have, and so on. Not one of these questions, nor any question like them which involves right and wrong or good and bad, can be answered by science, now or ever. . . In my judgement it is philosophy, not science, which should be uppermost in any culture or civilization, simply because the questions it can answer are more important for human life. Certainly it should be clear that the more science we possess, the more we need philosophy, because the more power we have, the more we need direction. First of all, let me apologize for not posting in a few days. The wonderful monsoon storms this time of year in central Arizona mess with the electronics around here. Sure enough, the internet service has been pretty sketchy the past two days. Sorry. Fortunately, storms have no effect on my books. I can read them rain or shine. 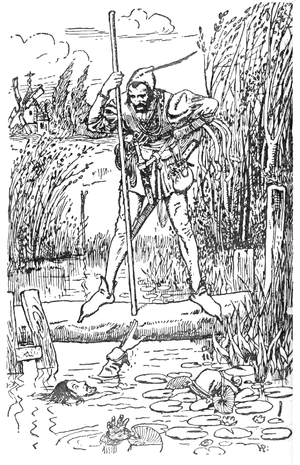 As I promised a few posts ago, I’ve started reading the Paul Creswick version of “The Adventures of Robin Hood,” originally published in 1902. My copy is from the Reader’s Digest Association and includes some amazing illustrations by N.C. Wyeth. Believe me, I could just stare at these pictures for hours. I’m only 10 chapters in at this point, but I wanted to share one of the best things about this book so far; the words. Of course, Creswick conveys a strong sense of Robin’s era with his use of words, particularly the idioms of the day. For someone like me who loves words, this book is a treasure. Here’s a small sample. One of the supporting characters so far is a monk, called an anchorite in the book. Anchorite comes from a Greek word, anachorein, which means to withdraw or to make room. So our anchorite lives in self-imposed seclusion for religious reasons. A little later in the tale, young Robin drops his bodkin in the forest. Before you jump to any conclusions, a bodkin is the Middle English word for a dagger or a stiletto. It can also be an ornamental hairpin shaped like a stiletto, but I doubt Robin would have threatened a robber with a hair accessory. Just one more, I promise. While exploring his room at his uncle’s estate, Robin comes across a “bench in the nook, curiously carven and filled with stuffs and naperies.” Napery means household linen, especially dealing with the table. It comes from the French nappe or nape meaning tablecloth. Our modern word napkin comes from this. Whether Robin and his Merry Men ever used them is another question. There you are, some wonderful old words from the Middle Ages. A special thanks to my Webster’s New Collegiate Dictionary for the great information on the word roots. A good dictionary, used well, is a joy. I recently gave you a brief overview of my reading so far in “A World Lit Only By Fire” by William Manchester. Now I’ll give you a taste, a postcard from the book so to speak. Honour to the old bow-string! Honour to the woods unshorn! Honour to the Lincoln green! Honour to the archer keen! And the horse he rode upon! Granted, the real Robin was probably nothing at all like Errol Flynn and was more than likely not a very nice man. But something is his life and exploits was tale-worthy. Something endeared him to the peasants who built his legend. A history made of facts alone and stripped of all lore tells us very little about the humans who lived in it. The facts and the stories must go together. I have a copy of “The Adventures of Robin Hood” by Paul Creswick, who was one of England’s best children’s writers. According to the introductory material that came with the book, it has been in print ever since it came out in 1902. It is filled with the stories of Robin Hood. It also has gorgeous illustrations by a different legend, N.C. Wyeth. If you’ve ever seen any of Wyeth’s work you’ll understand why I used the word legend. With due respect to William Manchester, I’ll be reading this book soon and hopefully learning more about Robin and life in the middle ages. So here we have chapter four of “Orthodoxy” by G.K. Chesterton. As you can tell by the chapter title, Gil can get a bit whimsical. To be honest, I’m not sure where the heck he pulled this one from, especially since one of the first quotes from the chapter has nothing to do with ethics or Elfland. This is the first principle of democracy: that the essential things in men are the things they hold in common, not the things they hold separately. We all like astonishing tales because they touch the nerve of the ancient instinct of astonishment. We all hold in common the need for a sense of wonder and we find it in Elfland. As for the ethics thing it’s a bit of a stretch, but if you’ve read many fairy stories this should sound familiar. In the fairy tale an incomprehensible happiness rests upon an incomprehensible condition. A box is opened, and all evils fly out. A word is forgotten, and cities perish. A lamp is lit, and love flies away. A flower is plucked, and human lives are forfeited. An apple is eaten, and the hope of God is gone. Chesterton believed in the world as a magical place and the fairy story was his template for understanding it. Most fairy stories had conditions which the hero or heroine had to uphold for order and happiness to continue. Ethics are those conditions which keep the story going. The conditions, or ethics, are put there by the author of the tale. In other words, life has a purpose. It is a story. It is “intended” by someone. This is opposed to the materialists who mostly saw the universe as a vast machine. The size of this scientific universe gave one no novelty, no relief. The cosmos went on forever, but not in its wildest constellation could there be anything really interesting; anything, for instance, such as forgiveness or free will. There you have it. Without the purpose, without the storyteller, true ethics do not exist. A machine has no choice. This modern universe is literally an empire; that is, it was vast, but it is not free. Just in time for Father’s Day, our local library had a “Huge Outdoor Book Sale.” Just read the flyer. It says so. 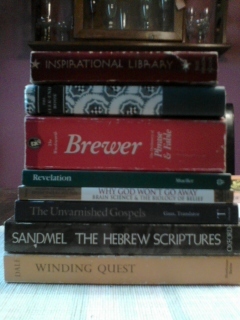 Needless to say, I scored some great books as you will shortly read about. But first, let me say “Thanks!” to the “Friends of the Chino Valley Library” for all their hard work in putting this sale together. They do this once or twice a year and I never miss it. 2) “The Hebrew Scriptures: An Introduction to Their Literature and Religious Ideas,” by Samuel Sandmel (Oxford University Press, 1978) Sandmel was only one of the greatest Biblical scholars ever. 4) “Why God Won’t Go Away: Brain Science and the Biology of Belief,” by Andrew Newberg, M.D., Eugene D’Aquili, M.D., Ph.D., and Vince Rause (Ballantine Books, 2002) According to the back cover, “explorations in the field of neurotheology.” O.K. We’ll see. 5) “The People’s Bible: Revelation,” by Wayne D. Mueller (Northwestern Publishing House, 2002) A commentary on the Book of Revelation based on the New International Version of the Bible. Never my favorite New Testament book, so I figured I’d better learn more. 6) “Brewer: The Dictionary of Phrase and Fable,” by E. Cobham Brewer (Wordsworth Editions Ltd., 1993) From the back cover: “This invaluable dictionary explains the origins of the familiar and unfamiliar in phrase and fable. It includes the colloquial and the proverbial, embracing archaeology, history, religion, the arts, science, mythology, books and fictitious characters.” The new and enlarged edition was published in 1894. This is going to be fun! 7) “The Weekend Book,” Francis Meynell, editor (Duckworth Overlook in association with The Nonesuch Press, 2006) I haven’t a clue. It caught my eye and then my attention. Best I can tell, it’s like one of those “bathroom readers” but intended for an English weekend. I’ll get back to you. 8) “Inspirational Library,” four small books of compilations; Prayers for all Occasions, Psalms and Hymns, The Parables, and Best Loved Carols. Illustrated by Janet Robson Kennedy (Blue Ribbon Books, Rudolph J. Gutman and Samuel Nisenson, 1949) Four small books with beautiful period drawings by Robson. For the pure, simple pleasure of owning them. I’m a happy daddy. Happy Father’s Day! So who said that? Pat Robertson? Max Lucado? Rick Warren? That quote comes from a Mr. John Chapman, better known as Johnny Appleseed. That also happens to be the name of the book I’ve been reading the last week or so. “Better Known As Johnny Appleseed,” by Mabel Leigh Hunt (J.B. Lippincott Company, 1950) is a charming little book that I picked up many years ago and am finally getting around to reading. For as long as I can remember, American folklore has always captured my imagination. I couldn’t swear to it, but it may have been Walt Disney Studios’ marvelous animated features of these great tales that started my life-long interest in them. These folk stories, or “tall tales” as they’re sometimes called, are more than fanciful yarns made up to kill time or establish bragging rights around a frontier campfire. They can tell us much about the spirit and character of our nation and its people when both were young. If you doubt that, consider what the television programs streaming into American living rooms each night can tell us about our current culture. A people’s stories are windows into their hearts. The panorama of Johnny Appleseed’s life and legend is like a delicate old tapestry, its fabric worn with age and much handling, its fabulous leaves and flowers and fruits, its beasts and men ofttimes undiscernible, its fantastic story not quite clear. It is rich and humorous and lovely. It could never be anything but American. Cleverly arranging historical sketches and a collection of tales, “Better Known As Johnny Appleseed” is divided into three sections: The Seeds, The Fruit and The Harvest. The first and third parts give us the facts of John Chapman’s life and bookend the tales by which we have come to know him. He was born on September 26th, 1774 in Leominster, Massachusetts. His father, Nathanael, was a “Continentaler” and fought in the Revolutionary War. His mother, Elizabeth, died when he was but two. Closed to history but open to conjecture is the origin of Johnny’s love of apples and nature. He was also very religious, a follower of Emanuel Swedenborg. As did many in the young country, Johnny caught the “western fever” and in 1792, along with his half-brother Nathanael, he headed west. The West was the Wyoming and Lebanon valleys and a web of streams that led to the great westward-flowing highway of the Ohio. . . The West was aching farewell and perilous adventure, hardship and hope and faith. It was a great dream. And the heart of it was a freedom such as men had never known before. It was in the West that John Chapman became Appleseed John and ultimately Johnny Appleseed. The nine tales that make up “The Fruit” of the book are, as Mabel Leigh Hunt tells us, “based upon both truth and tradition.” They not only show us a young man becoming a legend, but a country becoming a nation. There’s the story of Andrew McIlvain, 13 years old and carrying the United States mail between Franklinton and Chillicothe in Ohio. Johnny meets him on the lonely road and shares tales and news. Or Zack Miller, 18 years old and the youngest of four government scouts during the War of 1812. They run across Johnny in northern Ohio and he warns them not to hunt game because “the report of a gun will bring the Indians a-swarming out of their hidings.” They ignore him and barely escape the peril that comes. Dies . . . in this neighborhood, at an advanced age, Mr. John Chapman (better known as Johnny Appleseed). The deceased was well-known throughout this region by his eccentricity, and (his) strange garb . . . He submitted to every privation with cheerfulness and content, believing that in so doing he was securing snug quarters hereafter . . .
Johnny Appleseed lived a life almost perfectly suited to a new country born for freedom. Reading the stories of his comings and goings, one gets a small sense of the overwhelming experience of freedom the people of this new nation must have had. I pray that some tiny part of that experience still flows through the American bloodstream.